Shift Firmness: Stock (for stock rebuild kit)MildMedium firmOh hell, hang on! This is a *DIY Kit* designed to allow you to rebuild and upgrade your existing valve body to either stock or J-Mod specifications. The options for modification are based off of a kit that I have been offering since the late 90's built using instructions provided by a former Ford engineer on how to provide the best in performance and reliability for these transmissions. This kit is customizable with options for mild, medium and very firm shifts via the drop downs above. See notes 1 and 2 below for more information. If you have your own drill bits or want to purchase the kit as a stock 'rebuild only kit' using your own plate, choose "None" for the Separator plate modification method. Choosing this method will only supply what is needed to rebuild a valve body to stock specifications. 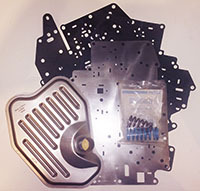 If you need a custom modified pre-drilled separator plate choose the appropriate plate for your model year for the Separator plate modification method. If you wish to modify your own existing separator plate and need the correct drill bits choose "Selective drill bit kit for DIY plate modification" for the Separator plate modification method. Stock= Stock with no modification. Mild= More noticeable shifts than stock. Very suitable for a daily driver. Not at all abusive. Medium firm= Obvious shifts. More suited for street driven performance. WOT chirp. Oh hell, hang on!= Firm shifts. More suited for race applications. WOT bark or mild spin. It has been requested that I include the Sonnax 76948-09 Main pressure regulator valve or the 76948-12k Elevated pressure regulator kit. I will sell you those items if you contact me directly to gain understanding of the risks and that I will accept no responsibility for their use. *This is a DIY kit. If you plan to buy this kit to have a shop do the labor then please ask their labor rate per hour and count on around 3 hours to do the job right.